It’s January again, a time for planning the New Year’s activities, films to watch, ones to look forward to and also a time for reflection. Unsurprisingly I have been thinking about the films I’ve seen this year – of which there are hundreds when I include cinema outings, DVD’s rented, films watched online and special ones bought or borrowed. 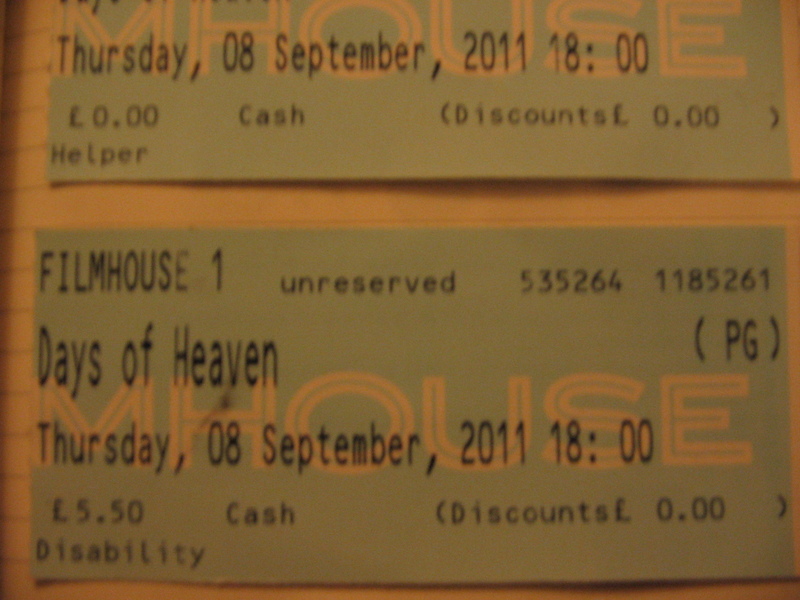 In order to narrow down my review of 2011 however, I am going to concentrate merely on cinema experiences; represented here by pictures of the tickets I have archived for the year. They include those of re-released classics, as those moments when the lights go down and the curtain pulls back are truly ones worth investigating! In no particular order then, I begin with Wim Wenders’ Pina, a 3D documentary about the late choreographer Pina Bausch. Featuring interviews with dancers and collaborators as well as archive material of Pina herself, some of the real pleasure of this film came from the new performances of her work. Whether on stage or taken outside into the landscape or urban space, the intangibility of the digital created a wonderful tension, as movements appeared indiscernible from one dancer to the next and leapt from the screen. Le Quattro Volte, on the other hand, directed by Michelangelo Frammartino also contained one scene that seemed choreographed like a dance, although so precise as to utterly convince as an hilarious accident, involving a dog, a truck and some goats. An almost wordless film, philosophical in intention – I’m stuck as to other films I’ve seen recently that so perfectly combined form and content. I didn’t want it to end. 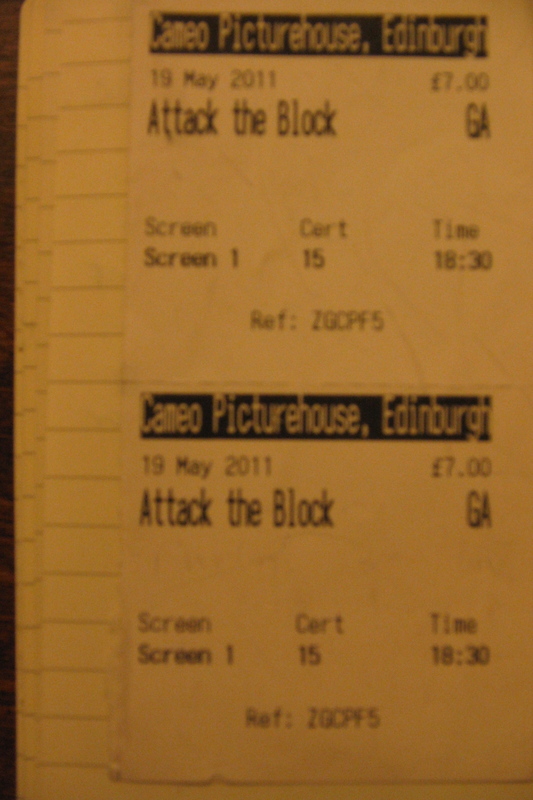 In total contrast to that I really enjoyed Attack the Block, the directorial debut of Joe Cornish, one half of comedy team Adam and Joe(the other being Adam Buxton, of course). Wearing its horror and sci-fi influences firmly on its sleeve, Attack the Block gloriously celebrated the underdog and the delights of analog effects. The simplicity of the creature design – a beast with seemingly impenetrable black fur and the wittiness of the dialogue combined for a truly refreshing and hilarious British film. Speaking of darkness – never has it been put to such startling use than in Béla Tarrs’ Turin Horse. Bleak in tone, repetitive in its plot and seemingly negative overall – I was captivated. Not one to see if you require your films to have explosions, or char acter development or a happy ending but if, like me you appreciate a unique world view about humanity and survival, then I wholeheartedly recommend you seek out this film. Especially as Béla won’t be making any more – as he said himself at the Edinburgh International Film Festival 2011: this film expresses all he has to say, and being about ‘apocalypse’, is a fitting end to a near 40-year career. 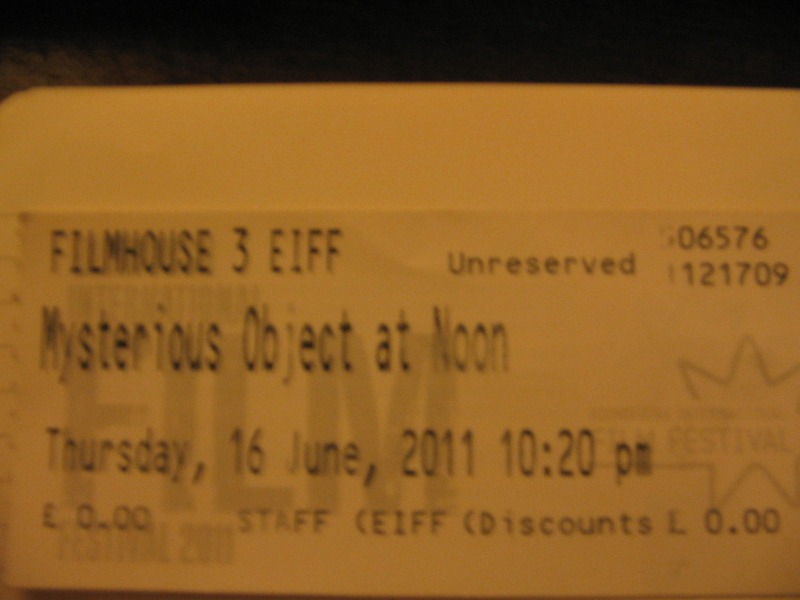 Also at EIFF last summer I had the pleasure of attending a screening of Apichatpong Weerasethakul’s Mysterious Object at Noon (2000). Having spent some time working through the feature films of this most marvellous Thai director I was excited to see his early work on screen – a rarity for sure (discussion of those can be found elsewhere on this blog). ‘Joe’ as Apichatpong likes to be referred to, had sent a video introduction in his absence at the screening, and he described how the conditions of making the film were so unique and special they could never be repeated – something that can certainly be said of his other works. An impression is given of a truly magical filmmaking process and a film that seems to evolve instinctively rather than being planned down to the last detail. 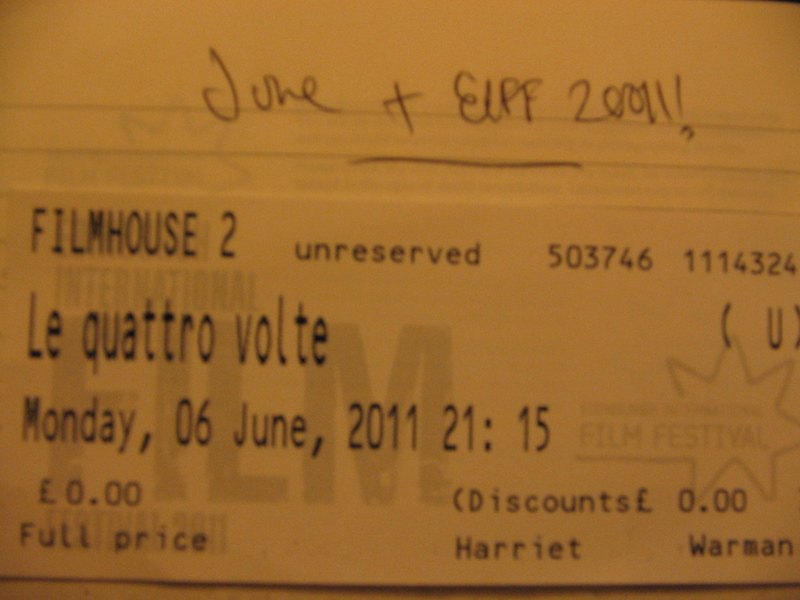 If you ever get the chance to see any of Joe’s films at the cinema – take it! In a similar vein there was another retrospective title that has proven itself one of the more memorable screenings of 2011. I have read a lot about Terrence Malicks’ The Tree of Life being the top of ‘best film’ lists for last year (notably in Sight & Sound) but if was the restored version of Days of Heaven (1978) by the same director that really affected me. 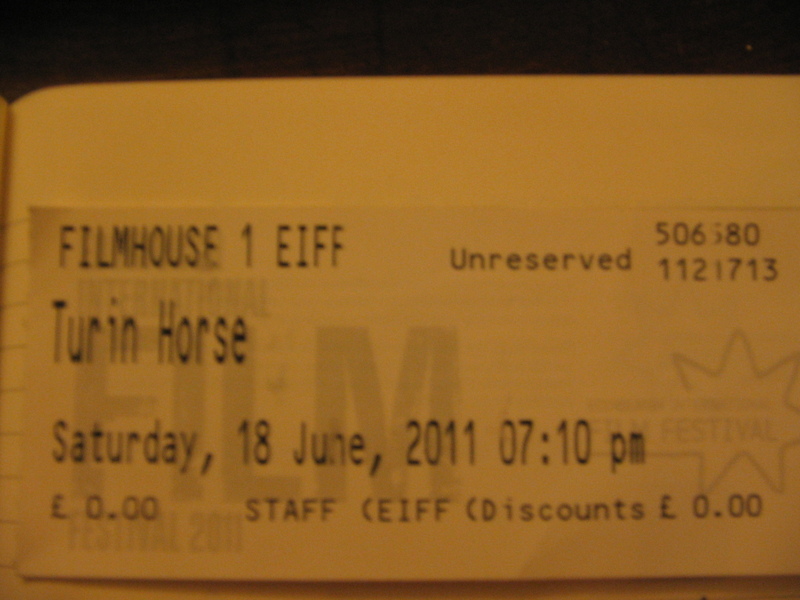 Projected at Filmhouse in glorious 70mm this was the perfect cinema experience. The story concerns a family of sorts who work as farm labourers – Bill (Richard Gere) and his lover Abby (Brooke Adams), pose as brother and sister to be more respectable, whilst keeping Bill’s sister Linda (Linda Manz) under their care. Their seemingly simple, tough but somewhat idyllic life becomes disrupted when the land owner (played by Sam Shepherd) falls for Abby. Malicks’ technique of using only natural light is never more spectacularly demonstrated than in the scenes of the cornfields at dusk, and sitting in the dark I was mesmerised. Moving back into the 21st century one of the last films I saw last year was also the best. Being someone who has championed Kenneth Lonergan’s You Can Count on Me (2000) for many years, I was keen to say the least to see his latest film Margaret. 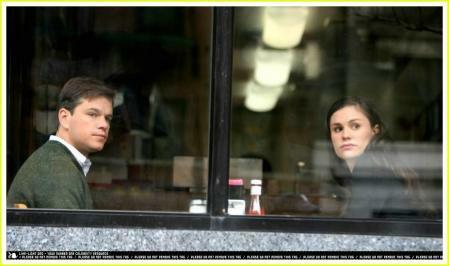 The film was actually made in 2005, but due to disagreements with the films’ financiers Camelot Pictures and Fox searchlight (that Lonergan failed to fulfil the terms of his contract, having gone over budget and failing to deliver a film of the agreed length, and on time) the film is only now seeing the light of day – and only just. In an attempt to ‘bury’ the film, Fox gave no press screenings and only after demands from London critics and twitter/Facebook users to give the film more screenings has it gotten a wider release in the UK – an example of social networking being put to good use. This is all only important because the film itself deserves to be seen. It has obvious flaws – its length, how messy it is and a central character (Anna Paquins’ astonishing performance as Lisa) that is very difficult to like. At the core though is a portrait of New York – damaged and traumatised post- 9/11 and portrayed beautifully by Lonergan as a place where traffic is constant, but only occasionally do people really relate to each other. There were many more fantastic films released in 2011, and some of them I only managed to see on DVD, but they are too numerous to mention here. I’ve already had one most memorable experience this year – Raúl Ruiz’s four and a half hour epic, Mysteries of Lisbon, which proved itself to be a true feast of cinema. I hope the year’s cinematic treats provide more opportunities for investigation.